Should you review your client’s estate plan? In the lead-up to 30 June 2017, we should be discussing new and pressing estate planning issues with our clients so that we can best assist them at a time when they will need help most. Not since the abolishment of the Reasonable Benefit Limit (RBL) system, have we as advisers or our clients been so concerned about super reforms, as when the changes were announced in May 2016. Cries of “should we just pull all of our money out of super?” were heard far and wide, and without any firm guidance, strategic planning needed to commence for the changes that were to come into effect 14 months later. For years, advisers have been establishing income streams for their clients to enable them to be self-sufficient and live their dream lifestyle in retirement, and enjoy the tax benefits associated with being in ‘pension mode’. With the proposed legislation having passed and royal assent being given, that dream lifestyle now has a cap on it. In many instances, when an adviser established a pension for a client, the pensions were set up as reversionary. This meant that on the death of the member, their pension automatically reverted to their spouse, no matter the size of the pension being transferred. Furthermore, the taxable and tax-free components, and the tax-free earnings were maintained in the same way. One concerning factor of the new legislation is that there are no grandfathering provisions, meaning those with existing pensions (including reversionary pensions) may be significantly impacted after 1 July 2017. What is the new ‘lifestyle’ cap? In accordance with the 2016 federal budget papers (now legislated), from 1 July 2017, there will be a $1.6 million superannuation transfer balance cap on the total amount of superannuation that an individual can transfer into retirement phase accounts. The cap will include any pensions that are currently in place, as well as any new pensions that are commenced after 1 July 2017. Any amounts in excess of this cap will be required to either be removed from the superannuation system altogether or commuted back to accumulation phase where the earnings will be subject to the 15 per cent tax rate. If the amounts are not commuted or removed from the superannuation system, there will be an excess tax applied to the excess transfer balance earnings (with earnings calculated on a notional basis) so as to negate the benefits of the tax exemption associated with being in pension phase. Will the transfer balance cap be doubled when receiving a death benefit income stream? Unfortunately, under the new rules, the deceased member’s transfer balance cap will not ‘transfer’ to the surviving spouse, but will be taken to the grave with the deceased member. As a result, if pensions were established as reversionary, the surviving spouse will have the reversionary pension amount added to their transfer balance cap, which could see them going into excess. The legislation does allow for a ‘restructuring time frame’. The time frame is 12 months (extended from the originally announced time frame of six months) to restructure the pensions and superannuation affairs of the surviving spouse in order to meet the transfer balance cap rules. This restructuring time frame is only available to members who have established their pensions as reversionary pensions. This means that if a member did not set their pension up as a reversionary pension, but rather stipulated in their binding death benefit nomination form that their spouse must take their superannuation balance as a pension (i.e. a new pension would be commenced), the 12-month time frame to restructure any existing pensions would not apply. There are strategies that can be adopted and if your clients see that you are in control, they will feel reassured. We are going to need to work closely with our clients who have already established pensions (whether they are above or below the new $1.6 million cap, or whether they are reversionary or not) and those who are about to commence pensions. The retirement and estate planning playing field will now have some extra obstacles that will need to be considered, but knowing your clients’ situations and what they are trying to achieve will help you in guiding them in the strategy that best suits their needs. What strategies could be adopted after 1 July 2017? There are a number of different options our clients will have after 1 July 2017 when one member dies and passes on their superannuation balance to their spouse. Each will have different tax implications, but this should not be the sole reason a particular strategy is chosen. There may be other criteria, such as the disposal of a lumpy asset that also needs to be taken into consideration. The different options can be shown in a simple case study. Bill and Mary are both 58 years of age, and between them, have $2 million in their self-managed superannuation fund. The balance is split 50-50 between the two of them. The fund has $700,000 worth of cash and shares, and a property worth $1,300,000. On 1 July 2017, Bill and Mary commence reversionary, account-based pensions with their $1 million balance. The assets have not been segregated so each pension is made up of $650,000 of the property, and $350,000 of cash and shares. Six months later, Mary dies. Probate on Mary’s estate was granted three months after her death. As her pension was established as reversionary, it automatically passes to Bill. 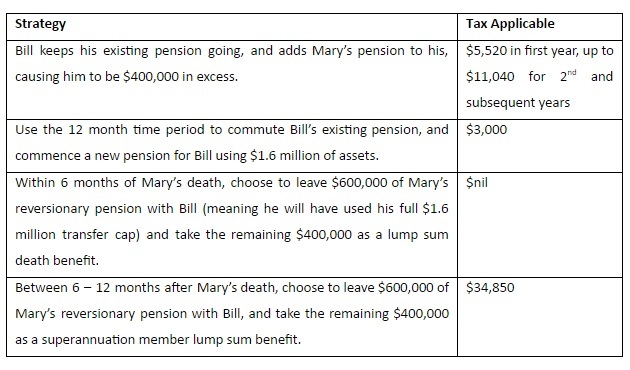 As Bill has already used $1 million of his $1.6 million cap, Mary’s balance of $1 million will cause him to be in excess of his transfer balance cap by $400,000. Depending on what option is taken, the tax implications can differ greatly. But this should not be the only consideration. Are there lumpy assets that may need to be potentially sold? 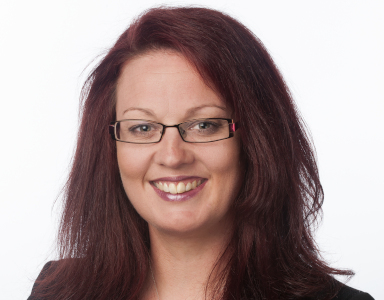 Would it be better to roll some assets over to a new superannuation fund to effectively segregate the assets? But perhaps most importantly, when a death occurs in the family situation, are our clients going to be too grief-stricken to make a decision in a timely manner?